Are you a father, mother or intending parent? 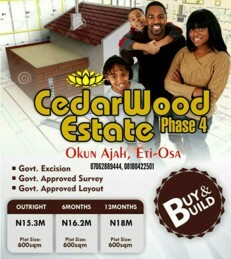 It's time to grab a lifetime opportunity by simply subscribing to our estate- *CEDARWOOD PHASE 2, IBEJU-LEKKI, LAGOS* -on or before 27th May, 2017. We believe your children are world changers, so why don't you empower them on time? Empowering your kids on time is a drive towards Social, Educational, Cultural, Political & National Revitalization of our Great Country. If get your child a job and you don't get them a piece of land, you've not empowered them. 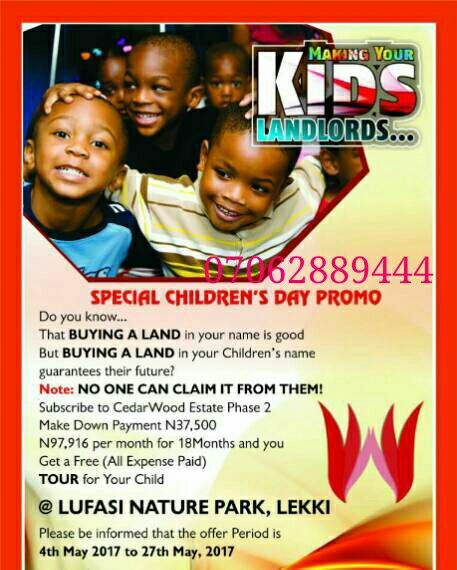 Let's eradicate Poverty Transfer from parents to children. 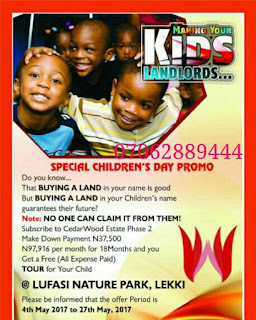 Get them a piece of land which will appreciate in value by over 500% before they are adults. It's a great investment without regrets.